This great horned owl sits on its eggs in a heron's nest off Osprey Point at Mill Pond. Its "horns" may look like ears, but they are simply tufts of feathers, which are often involved in owl body language. Their upright appearance here is a clue to the owl's interest in the humans who are watching it. A great horned owl in a heron's nest? Is this an April fool's joke? No, it's usual for owls to use empty nests made by other birds instead of building their own. As in past years, a great horned owl (Bubo virginianus) has moved into a heron's nest at Mill Pond. Great horned owls are year-round residents in this area and start breeding in late winter, well before the herons arrive. Great horned owls typically use nests of other large birds, such as red-tailed hawks, crows, and herons. Sometimes they even use squirrel nests. The great blue heron nesting area at Mill Pond is dwindling, but demand for the nests is steady. This year, only three nests remain in the dead trees that make up this nesting area off Osprey Point in the Headwaters Conservation Area. Two of these nests are platform-type heron's nests, and one is a rounder-looking osprey nest. Besides the great horned owls, some great blue herons (Ardea herodias) and a pair of osprey (Pandion haliaetus) are likely to take up residence in the months ahead. Herons that no longer nest here may go a bit farther north to a large heron nesting area that can be seen from Route 2. You can view the three remaining nests at Mill Pond from the shore through binoculars or a telephoto camera lens. Anyone who ventures closer--over ice or open water--should be very careful not to disturb the nesting birds. In other words, don't get too close. Great horned owls are named for their great size and for the tufts of feathers that look like horns or ears on their head. They are also sometimes called cat owls, probably because of their large yellow eyes and the ear-like tufts. Because of their hoot, typically heard at night, they have also been called hoot owls. Great horned owls are fearsome predators and have earned the nickname winged tiger. They usually hunt at dusk, dawn, and night. Not only do they see well in the dark, but they also have excellent hearing that helps them detect and follow their prey. They fly silently and can catch their prey by surprise. These owls are large, with a wing span up to 5 feet, and often go after large prey, sometimes even heavier than themselves. Favorite food includes rabbits and squirrels. Great horned owls even take skunks and porcupines, both also active at night, and occasional housecats, wild turkeys, and turtles. Large numbers of mice, as well as other owls and birds, regularly become food for them. When food is scarce, or when there are hungry young to feed, great horned owls also hunt during the daytime. Day or night, they hunt by watching for prey from a perch, such as a low branch, or by flying slowly over an open area. Not surprisingly, these well equipped predators are not popular neighbors at Mill Pond. When the osprey return to the nesting area, they usually act aggressively toward the great horned owls and work to chase them off. Osprey are birds of prey that specialize in catching fish. How do great horned owls see and hear so well, and fly so silently? Like most predators, including ourselves, these owls have forward-facing eyes. (Typical prey animals, such as rabbits, have eyes on the sides of their heads.) The owls' eyes, like ours, have special cells called rods, for black-and-white vision and low light, and cones, for color vision and bright light. Owls' eyes have many more rods, and few cones, so they see far better than we do in the dark. Owls' ears are extremely sensitive to sounds, but they are also set unevenly in their heads, slightly higher on one side than the other. This set-up helps the owls use the split-second differences in the time that sounds arrive at their ears to pinpoint the location of prey. The owl turns its head toward the sound of its prey and flies in that direction, making adjustments as the prey moves. The secret to the great horned owls' quiet flight lies in their feathers. The edges of some of their wing feathers are comb-like, rather than smooth. This tooth-like unevenness breaks up the sound of air rushing over their wings, making their flight silent and deadly. 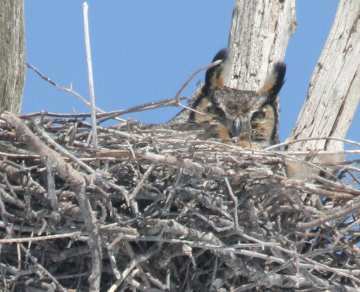 Great horned owls typically lay two or three eggs, which hatch after about a month. The nestlings are downy at first and grow quickly, fed by both parents. After about 6 weeks, they leave the nest for nearby branches. They fly well by nine or 10 weeks. The parents may continue to feed and tend the young owls through the summer. A few hours after a meal, and before they can eat again, owls throw up a pellet made of the parts of the meal that they can't digest, such as fur, feathers, bones, and teeth. The great horned owls is one of the most common and widespread owls in North America.